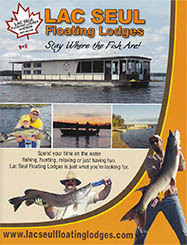 Lac Seul Floating Lodges - Hudson, Ontario: Houseboat rental availability. If you are looking for something specific and can not find it listed, please contact us as new available dates will open up with cancellations coming in over the winter. For our Canadian residents, please contact us for additional open dates (your group must all be residents of Canada as per the Ministry of Natural Resources).